The carnival season on Gran Canaria starts every year around February in the capital Las Palmas and it lasts for several weeks. In the period until March, the carnival in Gran Canaria makes its way from north to south through the various communities of the island. The highlights of the carnival are the parades in Las Palmas and Maspalomas. The Carnival of Gran Canaria is one of the most important in the world. Hundreds of thousands of people gather every year from all over the world to celebrate it. It is similar to the Brazilian carnival. This is probably due to the influence of the many Latin Americans who live on the island. The mild temperatures that prevail at this time of year are also a decisive factor. 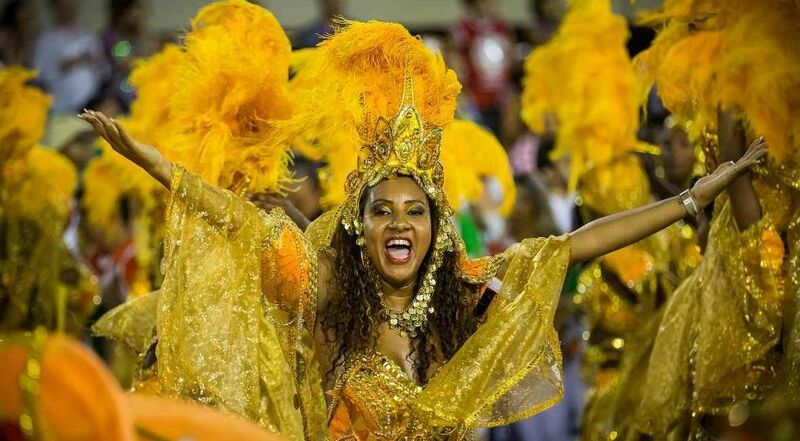 The carnival is lively, colorful and accompanied by hot samba and salsa rhythms. Below you will find all the important information and the dates of all carnival events in Gran Canaria in 2019. Basic elements of the celebrations are the various galas in which the most important representatives – Queen and Drag Queen – are chosen. This also includes the competition of the traditional music bands “Murgas”, who make fun of the government and the society with their satirical songs. And then of course there’s the parade “La Cabalgada” and the street carnival the “Mogollones”. The culminating end of the carnival is the funeral of the sardine on the beach “El Entierro de la Sardina”. The star of the carnival in Gran Canaria is the queen “La Reina del Carnaval”. She is chosen at a gala from various female candidates. Many young ladies present their impressive gowns at the gala. The sumptuous garments are worth thousands of Euros and consist of a great number of colorful feathers, innumerable glittering sequins and sparkling stones. They have a diameter of up to 3 meters and can weigh 60kg. It takes a lot to wear these heavy-weight dresses with the meter-high headdress with grace and a beaming smile. The most elegant participant with the most spectacular robe is elected Queen. Also, the drag queens are an absolute must and cannot be missed anymore at the Canarian carnival. The performances of the travesty artists are not less impressive. With shrill costumes and on shoes with dizzyingly high platforms they present some breathtaking dance performances. And again, the best performance will be awarded. The black humor in the texts in the mocking songs of the “Murgas” unfortunately is not understandable for the tourists because of the language barrier and the lack of political and social knowledge. But the colorful costumes and the makeup of the vocal groups are definitely an optical experience. Everyone benefits from the street parties the “Mogollones“ though, those are in the evening following the various events. The party people gather in the streets and in the bars, singing and dancing until dawn. On the day of the parade, the colorful dance groups with their musicians and the big colorful wagons finally take over the entire streets. However, the fun does not end when the parade finishes, it is basically just initiated by it. The party will go on until the early hours of the morning. While the subsequent celebrations in Las Palmas take place in the Santa Catalina Park, the party-animals of Maspalomas move into the Yumbo Center. But also the other less touristy communities such as Agüimes, Telde or Mogan know to celebrate. Their parades are not that big, but in terms of celebration they are in no way inferior to the two carnival capitals. Since there are no unitary appointments, but the parades take place one after the other, you can go and party everywhere! The burial of the sardine puts an end to the carnival activities. A huge cardboard sardine is carried by a funeral procession through the village to the beach. The fish is followed by its many mourning widows, mostly men in women’s costumes, priests and pastors. At the beach, the sardine is finally burned and a big firework opens the final celebrations. Thanks for the schedule! I really like the article you've shared above! I don;t like the way how the Carnival ends. Thanks for the schedule! I really like the article you’ve shared above! I don;t like the way how the Carnival ends. The celebrations of this kind attract with their unusual atmosphere and bright outfits. The festivals are popular due to their scale.